Passaic Neighborhood Center for Women: Happy Feast Day! Today on the Feast of Saint Elizabeth Ann Seton we send greetings to the Sisters of Charity of Saint Elizabeth, Convent Station, NJ, who have been so supportive and active in the founding and growth of the Passaic Neighborhood Center for Women. A brief history of the Sisters of Charity of St. Elizabeth can be found here. During the pre-beginning and beginning stages of the Center, Sister Marion Scranton, SC, (then Vice-President of Mission at St. Mary's General Hospital, Passaic) provided valuable guidance. For the first few years of the Center's existence, Sister Mary Culhane, SC, taught English and Art. The Center continues to be graced with the presence of Sister Patricia Reynolds, SC, who teaches our quilting class. 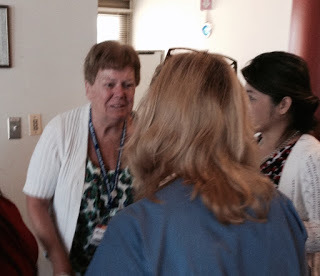 Additionally, we collaborate frequently with Sister Anne Moroney, SC, Director of Community Health Outreach at St. Mary's General Hospital and with several departments at St. Joseph's Health, Paterson, NJ (a sponsored work of the Sisters of Charity). 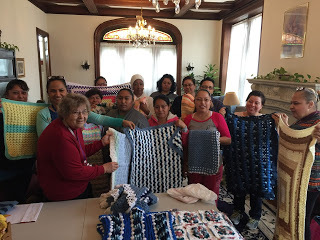 Sister Anne Moroney, SC, accepts donations of baby blankets from our crocheters.